Cabin crew have issued a Ryanair Crew Charter with a set of demands to the company. Yesterday (3rd July) workers convened at the offices of Fórsa for the first ever Ryanair Crew summit. Today, they have launched a Ryanair Crew Charter outlining the changes the company must make to bring it in line with comparable employers. Cabin crew from around 80% of Ryanair bases and ground crew from 100% of Ryanair bases were in attendance. The summit was organised by the International Transport Workers’ Federation (ITF) and European Transport Workers’ Federation (ETF), under the banner of Cabin Crew United. Cabin crew from around 80% of Ryanair bases and ground crew from 100% of Ryanair bases were in attendance. If Ryanair fails to respond promptly and appropriately then it risks industrial action over the summer. ITF and ETF support all lawful industrial action undertaken by their national affiliates with the aim of winning a fair deal for workers. 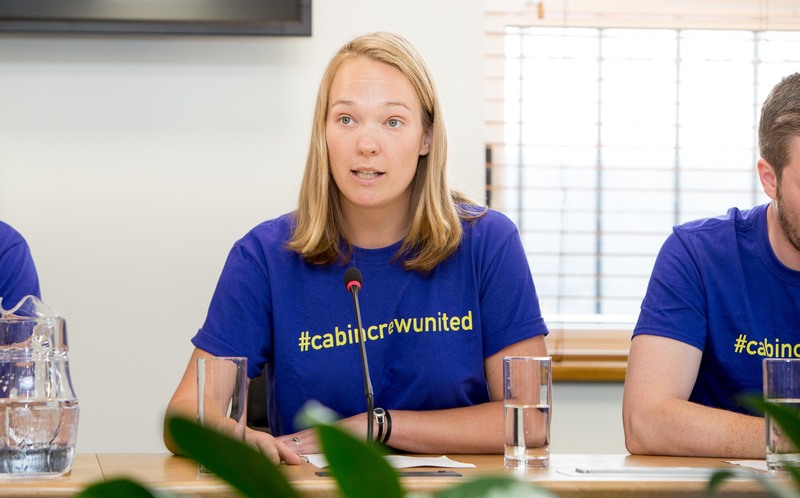 Cabin Crew United is an alliance of trade unions affiliated to the International Transport Workers’ Federation and European Transport Workers’ Federation (which includes Fórsa), dedicated to winning a better deal for Ryanair cabin crew workers.